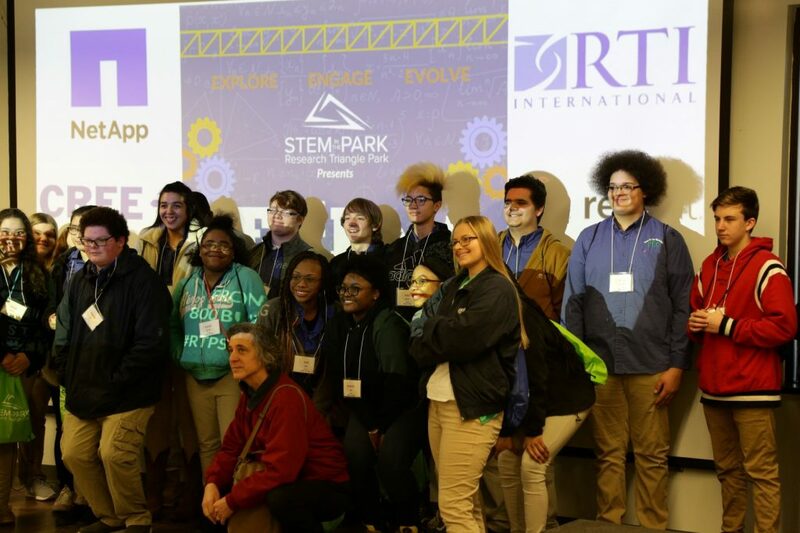 On Friday, February 1st STEM in the Park held our first ever EMFest (engineering and math)! With help from sponsors Red Hat, RTI, NetApp, Cree, Research Triangle Foundation, and AmeriCorps VISTA, we brought one hundred and forty-six students from seven North Carolina schools (Louisburg High School, Southeast Raleigh Magnet High School, Warren County High School, Person Early College for Innovation and Leadership, Neal Middle School, East Garner Middle School, and Mills Park Middle School) to the Research Triangle Park to practice their STEM skills and talk with the professionals themselves! 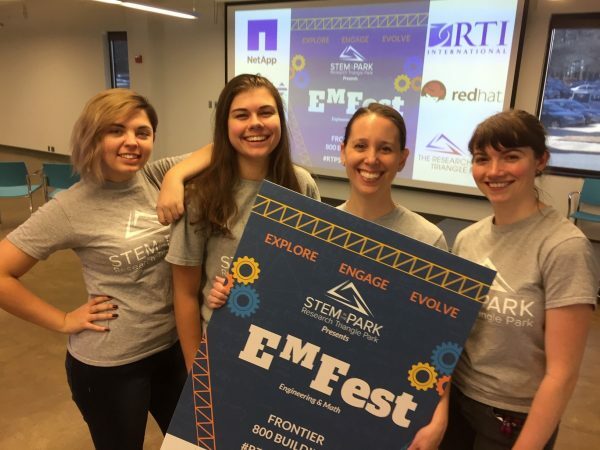 EMFest was the second in a STEM Fest series (TechFest, EMFest, SciFest) designed to connect students with engineering and math professionals, and caught the attention of local media sites such as EdNC! The fest included four engaging sessions: Think, Meet, Imagine, and Build. 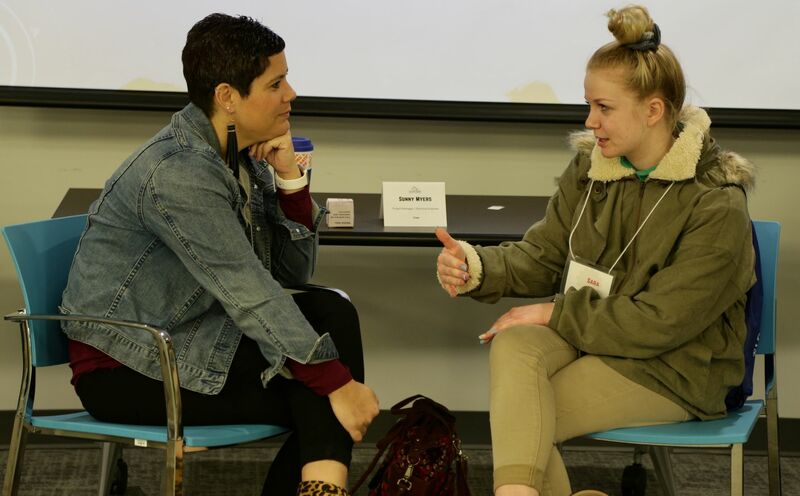 Students talked to engineering and math experts as they rotated between these sessions and were able to discuss the various paths that may lead to a fulfilling career in STEM. During Think, the students solved real-world problems in partnership with STEM professionals, using design thinking principles. 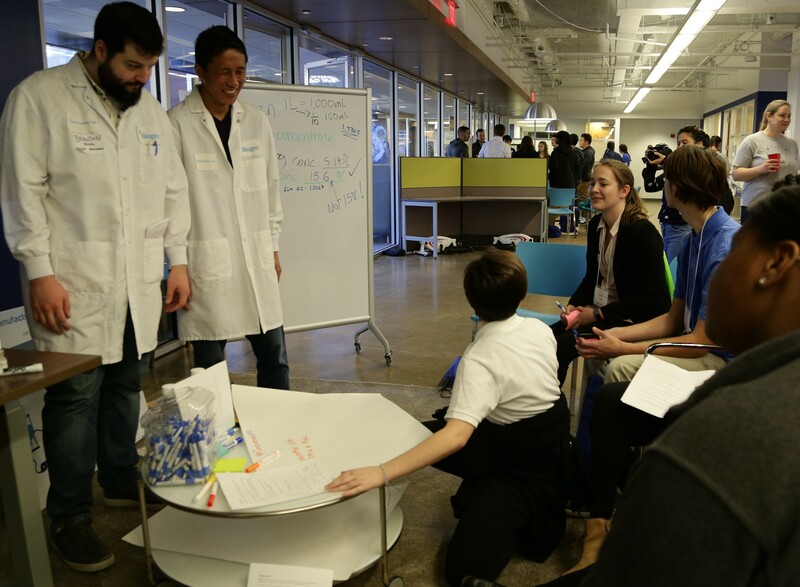 The students worked in small groups with one of seven organizations (Biogen, Citrix, Cree, IBM, NetApp, Red Hat, and RTI) that walked them through day-to-day challenges at work. 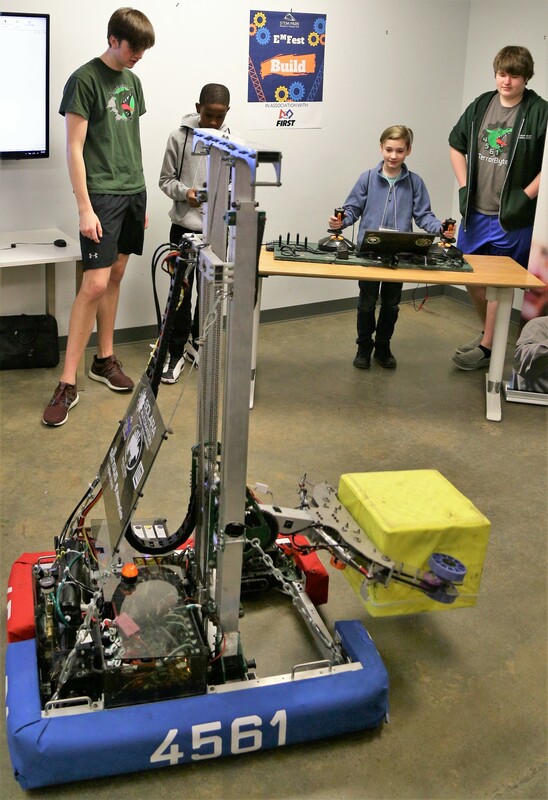 Together with the engineers and mathematicians, students were able to design their own solutions and reinforce their confidence in their own abilities. 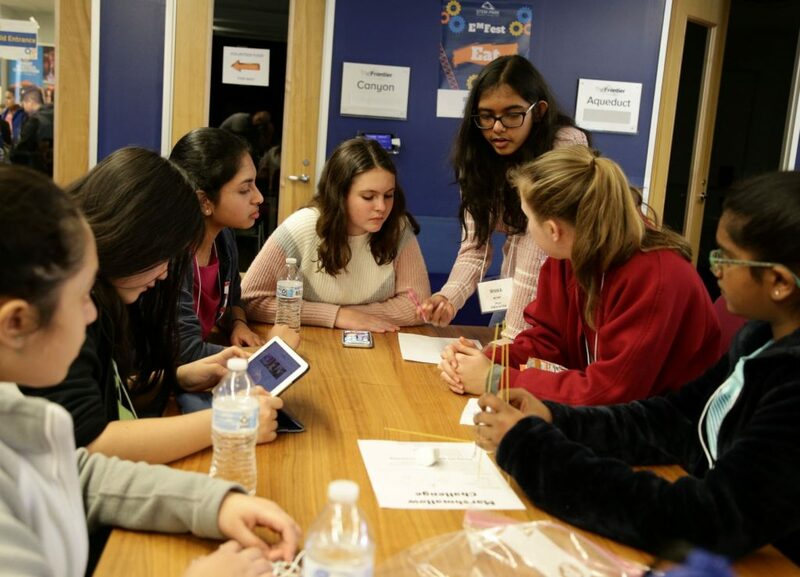 During Meet, students were able to talk to a wide variety of STEM professionals from companies like IBM, NetApp, and the American Board of Pediatrics, who work with engineering or math on a daily basis! 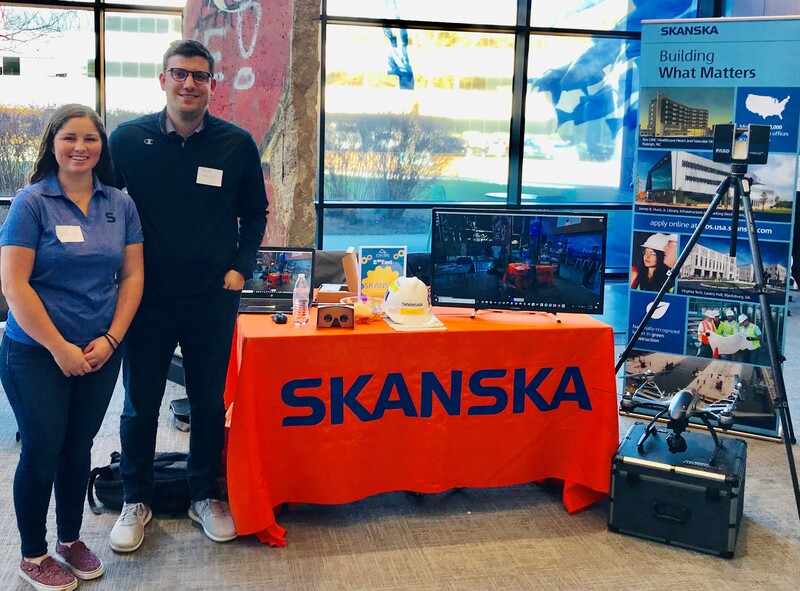 In Imagine, SAS, EPA, Skanska, Surface 678, Cree, and NetApp engaged the students with hands-on demonstrations, using a show and tell model to explain to students what these careers look like every day. Build was run by FIRST NC, a partner of STEM in the Park, who explained to students what goes into building and operating robots for competitions before letting them test drive a robot for themselves! Lunch was powered by IBM and provided by Publix for the students and Jimmy John’s, Fount Coffee, and Chick-fil-A for the STEM professionals. During lunch, students were able to take part in the Marshmallow Challenge, a game that teaches teamwork, the engineering process, material structuring, and the physics of motion and gravity. EMFest was an absolute success, and over 90% of students left knowing that engineering and math have a positive impact on their daily lives! For more statistics from EMFest, see our infographic below. 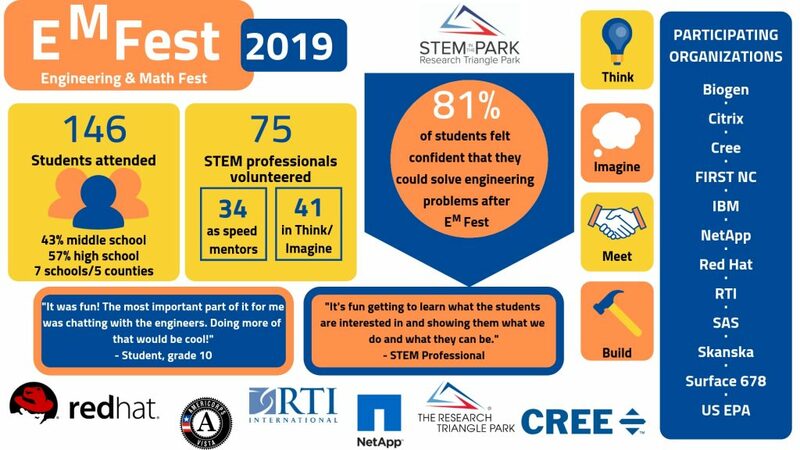 If you’d like to be a part of our next STEM Fest, click the links below or email us today at STEMinthePark@rtp.org! Sign Up for Our Upcoming Fest!